PenProtect is the most comprehensive and secure solution to password-protect the files within your USB Flash Drive, Flash Memory, Pen Drive or USB Stick. How to password protect Flash Drive, Pen Drive or USB Stick? Use PenProtect! PenProtect requires no installation. It is a single file located in the home folder of your USB Flash Drive, Flash Memory, Pen Drive, USB Key or USB Stick. Data protection is performed using an AES encryption (256-bit key) without changing the USB Flash Drive, Flash Memory or Pen Drive partition. Two protection levels (Partial and Total) to password protect USB Flash Drive. Ability to encrypt - decrypt only required files or folders. Immediate use of PenProtect to secure Pen Drive or protect Flash Drive or encrypt USB Stick. No size limit of encrypted files. Unique and individual protection for every Pen Drive with your Password. PenProtect comes with an internal manual that can be viewed with no Internet connection. Program PenProtect comes in many languages. Free technical assistance with Live Support! The Flash Drive, Flash Memory, Pen Drive or USB Stick is a USB Flash Memory Drive and can support up to 128GB disk space. A 8GB is 5600 times more than a 1.44MB floppy disk! A Flash Drive USB disk is a plug and play device. Simply plug it into any USB port and the computer will automatically detect it as a removable drive. Now you can read, write, copy, delete and move data from your hard disk drive to the Flash Drive or vice versa. Thanks to its small size, absence of mobile mechanisms (unlike a common hard disk) and affordable price, the Pen Drive is becoming increasingly popular among consumers. Due to its increased popularity, prices have reduced and GByte storage has increased. Unfortunately, users can often forget their Pen Drive in a computer, allowing other users to access their personal data. PenProtect is meant to secure your data in cases such as these. PenProtect software was created to password protect USB Flash Drive or password protect Pen Drive. 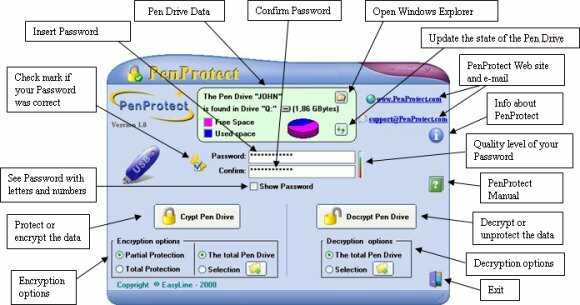 PenProtect requires no installation. PenProtect is useful to protect your data but is fundamental to solving the problems of privacy that are often found in offices or companies. PenProtect is especially indicated in a business, industrial and military (secret industrial - secret military) protection of data on production activity or organization. 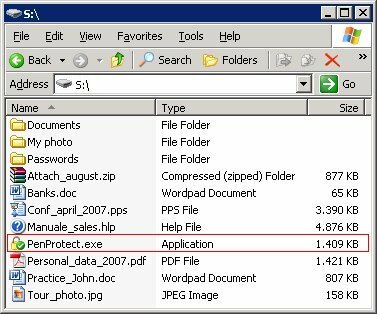 PenProtect works by running the file "PenProtect.exe" located within its USB Flash Drive. The file occupies very little space on your device: about 1 MB! In order to execute PenProtect, enter your Password (repeat for security in the field Confirm), then press the button to run data protection. Now your Flash Drive and Pen Drive are password-protect! Further information can be found in the Manual. Files saved in your USB Flash Drive, Pen Drive or USB Stick are encrypted using a new algorithm, AES with a 256-bit key, chosen also by the Government of the United States of America. For more information on the methodology used and AES security please refer to page in Wikipedia. After the encryption process, it will appear that the files and folders have strange names and make no sense. This is the effect of running PenProtect. It is not only encrypts the file content, but also the file name and folders. This makes it safe to insert personal data when naming files. To decrypt files run PenProtect, enter the Password and press the button to decrypt them. Data remains safe during the encryption and decryption process. After this process is finished, the option to restore the data is available. Your own USB Flash Drive or Pen Drive is individually unique. The same encrypted files cannot be decrypted by a user utilizing PenProtect with your same password! This concept is fully explained in the F.A.Q. The integrity of your data (USB Flash Drive) is continually being monitored by PenProtect. To protect the data, there are two possibilities: a "Partial" or a "Total" protection. The "Total" protection option is extremely innovative. Before and after encryption, it analyzes each USB Flash Drive in order to eliminate any file traces. During this process PenProtect program uses a specifically created algorithm. The "Partial" protection option requires about half the time of the "Total" one, but your data protection is not 100% secure. The current version of PenProtect works only on Microsoft Windows (95, 98, Me, 2000, XP, NT4, 2003 and Vista). No installation. It is a single and very small file located in your USB Flash Drive. PenProtect is always accessible and ready to password-protect your personal data. Data protection is performed using an AES 256 bit (the best of present technology) to encrypt, with a password, all private data, files and folders, stored in your USB Flash Drive. Our software is so efficient and user-friendly that EasyLine let you try it before you buy it. PenProtect is available for evaluation before you make your purchasing decision. The Demo version is avalaible here. PenProtect has won more than 50 Awards with 5 stars! See here the complete list. The PenProtect interface is extremely original and with just a few clicks, you can complete all the necessary operations to password-protect USB Flash Drive, secure Pen Drive or encrypt USB Stick. To get an estimate of your security password level you can have a look at the small bar. You can easily buy PenProtect by Credit Card or PayPal - in five minutes PenProtect is on your USB Flash Drive! Live Support - Instant answers to all your questions! Try the online "live support" chat with operator. Only 19 USD to password-protect your private data with PenProtect software! 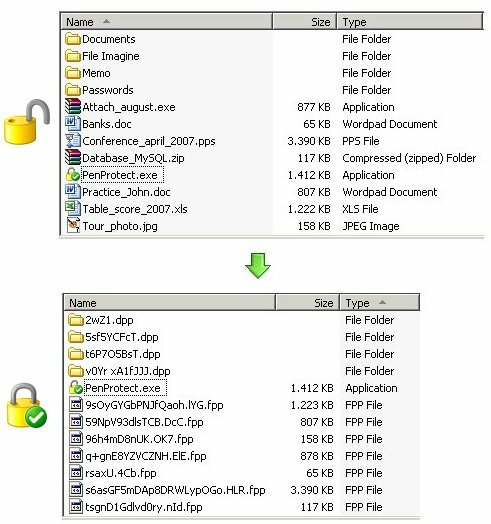 Some Screenshots to see how is it easy to secure Flash Drive or protect Pen Drive or encrypt USB Stick files and folders. F.A.Q. (Frequently Asked Questions) about PenProtect.